Ganden Ngamchoe, literally “Ganden Offering of the Twenty-Fifth Day,” or Lama Tsongkhapa Day, is a celebration of the anniversary of Lama Tsongkhapa’s parinirvana. It is celebrated on the 25th day of the 10th month of the Tibetan calendar. As preparation, set up 1,000 offerings to Lama Tsongkhapa (1,000 sets of 7 or 8 offerings, including water, lights, flowers, incense, and tormas). If one is not able to do all these offerings, then set up as many hundreds of offering bowls as possible. Perform the puja of 1,000 offerings to Lama Tsongkhapa. [If you’re using the 1,000 offerings to Maitreya text from the Maitreya Project, the actual offering verse needs to be changed so that it is to Lama Tsongkhapa]. You should recite the actual offering verse 1,000 times. “Palden Sasumma” (Tibetan [dpal ldan sa gsum ma] or English [“Glory of the Triple Ground”]). This is a very special prayer of the Glorified One of the Three Realms; it was highly regarded by Song Rinpoche. “A Hymn of Experience” (“Lamrim Nyamgur” [lam rim nyams mgur]) is a brief presentation of the stages of the path composed by Lama Tsongkhapa. “Destiny Fulfilled” (“Togjo Dunlegma” [rtogs brjod mdun legs ma]), by Lama Tsongkhapa himself. 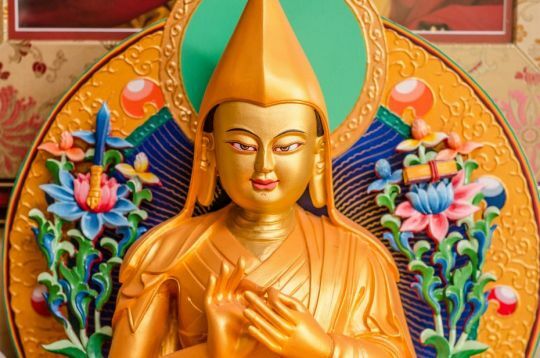 After each stanza that describes Lama Tsongkhapa’s attainments, we should rejoice. Rejoice at the qualities of holy deeds of Lama Tsongkhapa, by thinking how wonderful it is. Think: “May I also be like you.” This is what we should think after each verse. 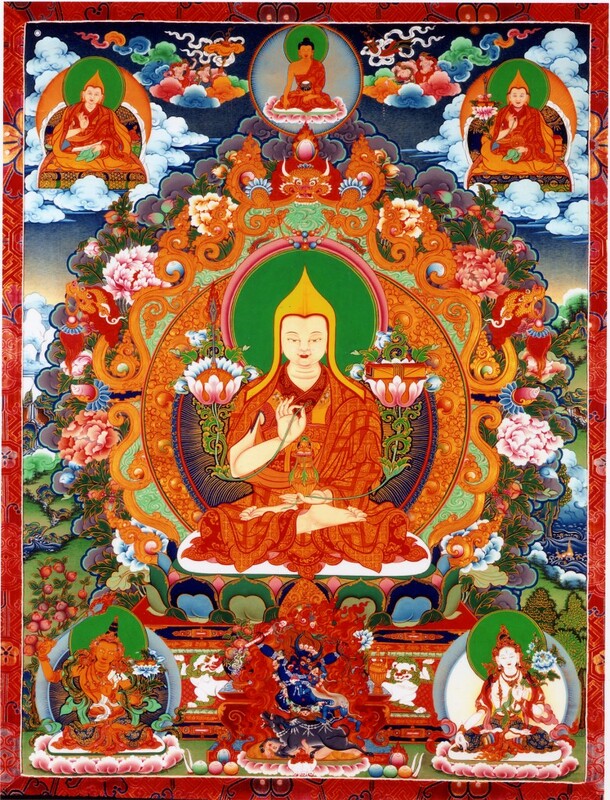 Also, we should pray that we too can achieve the same realizations and become like Lama Tsongkhapa, that we can achieve the same realizations and become as vastly beneficial as the sky, just as Lama Tsongkhapa did. In addition to the other offerings, it is best to offer as many light offerings as you can. It is very common to offer lights on Lama Tsongkhapa Day, even in Solu Khumbu, which is mostly Nyingma. Although the villagers and townspeople don’t really know about Lama Tsongkhapa, somehow that day and night they still do lots of light offerings. Just as many people often use lots of lights during Christmas and at marriages, we too should use lots of lights on Lama Tsongkhapa Day and on special days of Buddha and other auspicious days, especially if we are not able to offer them everyday, which would be good. The center’s students can hang up as many Christmas lights as possible. By offering lights, we create the cause of enlightenment, of liberation from samsara, and of the happiness of future lives. Also, success will happen in this life. Even if you hate happiness in this life, it will still come by the way. This is what you get from offering every single candle or Christmas light to the Guru-Triple Gem. You can hang lights around the center buildings, like a net of light offerings that cover a whole wall, outside and inside. The lights can be white or different colors. Or, you can hang lights over the trees and bushes or in the garden around the center. We generally use lots of Christmas lights just for parties or festivals. Instead, we should offer as many lights as possible to create the causes of enlightenment by offering the lights to Lama Tsongkhapa, the merit fields, and so forth. Therefore, use as many Christmas lights and candles as possible, as long as you don’t burn down the gompa or yourself! But you can burn the ego away. Burning a little bit of your nose or ear is okay too (this is just a little joke!) When we offer lights for marriages, New Year’s parties, and so forth, the many dollars spent, the entire expense incurred for the party is all wasted. And not only is it wasted, but all of it actually becomes negative karma because it is done with the attachment that clings to this life alone, unless the lights are offered with the sincere wish for other sentient beings to be happy and without attachment to this life. After completing the practices done on Lama Tsongkhapa Day, dedicate all the merit collected—beginning with the practice of refuge and bodhichitta, the seven-limb prayer, the various offering practices (outer, inner, and secret), any merit collected, skies and skies of merit collected—to achieve each of the special qualities of Lama Tsongkhapa’s teachings. To remember those special qualities, you can recite the text of “Lozang Gyaltenma” (“Prayer for the Flourishing of Je Tsongkapa’s Teachings” [blo bzang rgyal bstan ma]), which is commonly recited, or the prayer composed by Phabongkha Dechen Nyingpo that is at the end of the Yamantaka self-initiation text. Another text you can recite is a special prayer that expresses the special qualities of Lama Tsongkhapa’s teachings: Lama Tsongkhapa’s Secret Biography (Tsongkhapai Sangwai Namthar [tsong kha pa’i gsang ba’i rnam thar]) by Khedrub Je. Of course, one can specially recite one of the great teachings of Lama Tsongkhapa, while reflecting on that teaching, such as Drangnges Legshe Nyingpo (drang nges legs bshad snying po [The Interpretive Definitive Meaning of Good Explanation]) or Uma Gongpa Rabsel (dbu ma gong pa rab gsal [The Extremely Clear Explanation of the View]), a commentary on Madhyamaka. That would be especially great. Or, one could at least recite Lama Tsongkhapa’s short praise of Buddha, “In Praise of Dependent Arising” [“Dependent Arising: A Praise to the Buddha“]. To recite the Lamrim Chenmo, or Middle Lamrim, or Condensed Lamrim would be a very good way to repay the great kindness of Lama Tsongkhapa’s extensive beneficial works for the teachings of Buddha and for sentient beings. Scribed by Ven. Holly Ansett in November 2001. Rechecked and added to by Lama Zopa Rinpoche in March 2002. Lightly edited for grammar and punctuation by Ven. Constance Miller, FPMT Education Services, July 2002. Lightly edited by Michael D. Jolliffe, FPMT Education Services, November 2018. The main practice to do is Lama Chopa, available in the Foundation Store in hardcopy and digital formats. Consider making extensive light offerings on your altar or around your home, if possible. If one is unable to do Lama Chopa, consider Lama Tsongkhapa Guru Yoga. All are encouraged to recite any or all of the Lama Tsongkhapa-related prayers and texts mentioned by Lama Zopa Rinpoche above.